Loyal SFL reader Erin sent along today’s fundy website pick of the week: modestapparelusa.com. I think that it goes without saying that if you’ve ever owned a maternity culotte slip, you’re probably a fundamentalist. 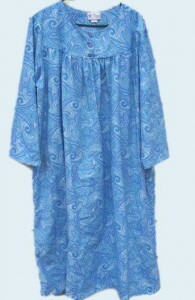 Since it’s also important to be modest in your own bedroom (one doesn’t want to be a stumbling block after all), the discerning fundamentalist lady can avail herself of a Blue Paisley Flannel Nightgown (only available in XL). This item is also known as the “Gotta Headache” and is one of the few methods of birth control that fundamentalists approve of. And what’s this I see? 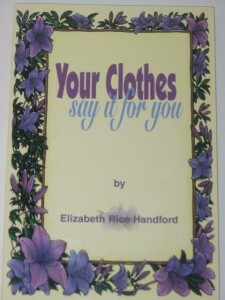 They’re selling copies of Your Clothes Say It For You by Elizabeth Rice Handford? Ahhh. Suddenly the entire site begins to make a lot more sense.